Juniper is synonymous with Central Oregon. The smell alone, pungent and dry, conjures the long-view horizon, a campfire under a dome of stars, a lone coyote slipping past sage. Juniper is also a weed, a native opportunist that has colonized huge swaths of land, drying up wetlands and displacing waterfowl. Both of these factors—the smell and the fact that it’s a weed—played into our decision to use juniper logs when my partner, Laurie, and I built a home in a small mountain valley in the North Cascades. We wanted a modest cabin. We did not, at first, want logs because we didn’t care for the hunting-lodge image and because we preferred what we considered less resource-greedy methods. We had more or less decided on stick-frame construction when a friend returned from a log-home show in Seattle giddy with excitement. “You’ve got to see these. They’re the most beautiful logs I’ve ever seen.” This from a man who worked with wood his whole life. We said we’d have a look. We hopped in the car and drove to Prine-ville, Oregon, where Lance Romine met us with the tip of a derby hat and a smile. He ushered us into his small juniper office, and we were stunned. Orange grain flowed and bled into yellow—colors and patterns as dramatic as those of sandstone formations that bear the dual stains of rivers and oceans over millennia—and swirled around plentiful knots, some inset like irises in bark-rimmed sockets, like dozens of melting surrealist eyes. We were half-sold before we even heard the story. Romine was born and raised in Prineville. He’d seen photographs of his great grandparents’ property, all big timber and grassland, and he’d watched it go to juniper. He remembers high ridges with clear views, now obscured. Anybody who knows that country can tell you the same. According to the U. S. Forest Service, land in Oregon classified as juniper forest increased from 420,000 acres in the 1930s to 6.5 million acres in 2005. The rapid transition, experts say, can be attributed to overgrazing in the late 1800s and early 1900s, years when cooler and wetter temperatures also proved just right for seedling germination. After that, the evergreen junipers simply out-competed native grasses and shrubs that go dormant in winter. Add fire suppression and, well, the junipers just kept on spreading. He did: log homes. But it’s not as simple as it sounds. Limbing the scraggly trees takes time, and milling the often radically tapered trunks—fat at the bottom, skinny up top—on a portable mill, you might lose as much as 45 percent by volume. Romine turned to post-and-beam construction. Since junipers don’t often grow tall, the shorter logs could work as infill between taller posts. The posts could be routed vertically to allow for a spline on which infill logs, routed on their ends, could be stacked like building blocks. We did not, for a moment, believe him. Romine never brags about what he knows, but he’ll tell you what he’s learned. There are, he explains, some things you don’t do. When he first started, for example, he squared off three sides but left one side round to maintain the traditional log-cabin look, but he found over time that the juniper logs bowed out toward the live edge. After that, he canted them, always, and the result is a log home with remarkably little movement, a dramatic look, and that heady gin-spice smell. Which is not always a selling point. Once at an open house, two women approached. The Romines’ home is built in the same post-and-beam style, but with larch. Juniper holds fasteners like a vice, and its natural oils prevent rot. Its compression strength nearly matches that of red oak. It shrinks 50 percent less than Douglas fir and 82 percent less than ponderosa pine. The supply is growing as research accrues and more grassland-restoration projects begin. Studies have shown that where junipers are removed, spring flows will increase. In control plots, where junipers remain, spring flows continue to dwindle or even go dry. 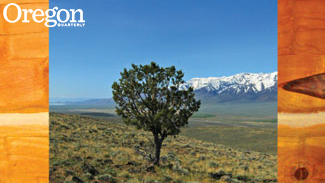 The Western Juniper Forum, a gathering of landowners, wood-product manufacturers, and conservationists, meets regularly to discuss uses for the trees as they’re removed. The biggest hope lies in biofuel, but there are others: dimensional lumber, artistic furniture, oils, fence posts, firewood, animal bedding. So far, none boasts the utility or the singular beauty of a juniper home. When the day came to stack our logs, Lance Romine traveled to join the work party we’d organized with neighbors. Sure enough, the logs went up in a day. Only a few details remained, including one tricky notch atop an angled post. The next morning, as Lance prepared to leave, we sat on lumber piles—joists and rafters to-be—and shared bakery treats. Suddenly he stood, cinnamon-roll crumbs in his beard, and grabbed a chainsaw. He climbed a ladder to sit atop one post and carve one perfect notch in another. He shut off the saw, finished the roll, doffed his derby, and he was off to the next job. Laurie and I settled in among the knots and swirls, the warmth of the yellow-orange heartwood, the smell that’s not, to us, one bit like body odor, and the knowledge that if juniper is invasive, so are we, in a way, as transplants from suburbia to the mountains. It’s comforting to know even weeds can find a home. Ana Maria Spagna ’89 is the author most recently of Potluck: Community on the Edge of Wilderness. She lives and writes in Stehekin, Washington.